Sometimes when I think back to college, I feel really old. So many things are different now. I didn’t even have my own computer in college – I spent so much time in the computer lab! I wonder if computer labs still exist. Well, I guess they must. But when I was in college, I didn’t have a cell phone or an ipad or any number of things that college students today must take for granted. I also used to stand in line in the book store. At the beginning of the semester, I’d go to my classes and get the syllabus – a print out, not something I accessed online – and I’d take my list to the store and try to find the books that were required. I liked to buy used, but of course I didn’t want my books to be overly highlighted – I wanted to be able to highlight them myself! Ordering books online never even crossed my mind. Saves you money. Costs are 40-90% off bookstore prices! Saves you time. No standing in lines at the bookstore! Plus, shipping is free. Offers the same benefits as buying from the store – you can still highlight your books! Donates to Operation Smile with each textbook rented – see more on that below. We have a top notch support staff. We hire problem solvers. Live help. Quick responses. We’ve been around since the beginning. We pioneered textbook rentals and you can be confident we know what we’re doing. You’ll save money. 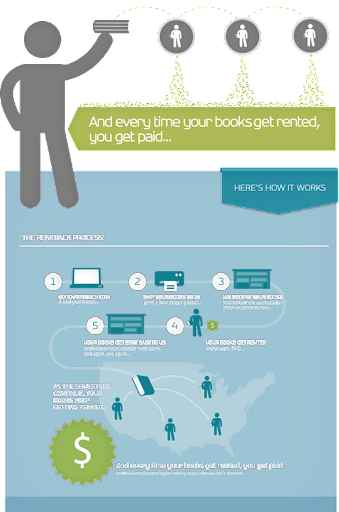 Pay less than half price to rent textbooks, and if you decide you want to keep the book instead of renting it, just pay us the difference and the book is yours. It’s really risk free. We have a 30 day risk free guarantee. Return your book for any reason within 30 days for a full refund. There’s tons of perks. Monthly giveaways, textbook scholarships, shirts, and other prizes. Registration is free and you do not have to be a paying customer to win. One more very cool thing about Campus Book Rentals, as I mentioned above, is that for every rented textbook, they make a donation to Operation Smile. Operation Smile provides free surgeries to repair cleft lip, cleft palate and other facial deformities for children around the globe. The long term improvement in quality of life for the children that receive these surgeries is almost incomprehensible. With every rented textbook, Campus Book Rentals donates to Operation Smile. That right there seems as good a reason as any to rent books through them! Who’s old like me? Did you stand in line at the bookstore or did you order your textbooks online? Or are you from the new generation who can rent their text books? If you are, I’m jealous! Disclaimer: This has been a sponsored post but all ideas and opinions are my own.